In his retirement, David Letterman has grown a beard and the beard has grown a following. He had a beard once during his "Late Show" tenure, when there was a writers' strike, but never to this wizard-like degree. This beard is a beard that would not have passed CBS censors. This beard is a beard that could house sparrows. It is a Retirement Beard. It is a biological reaction to a lifetime of performing under intense scrutiny. Letterman's face is saying, less than a year after his final show, that it is free. The public reacted first with admiration then with alarm. 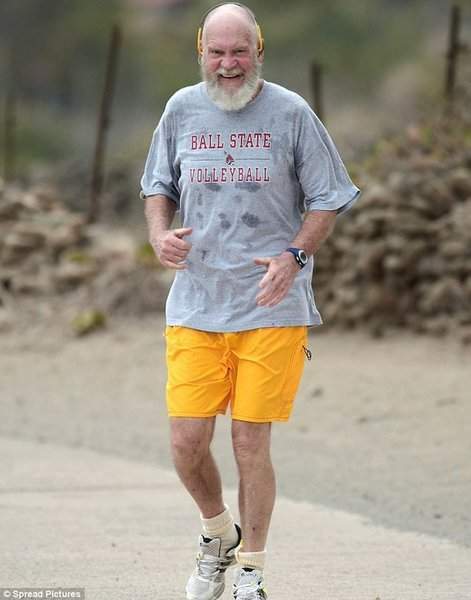 Letterman initially appeared statesmanlike and then, last week, a set of unflattering photos made the rounds. He was out for a run, without makeup or glasses, in chintzy sports gear. "Never retire," Esquire quipped cattily. "I've kind of developed a real creepy look with it that I'm sort of enjoying," Letterman told the Whitefish Review in December, when asked about his facial hair. "And I can tell that people are off-put by it. And the more people implore me to shave, the stronger my resolve is to not shave." Letterman surrendering to his own face is both an act of convenience and rebellion, but it's also an affirmation of the beard's inherent power. Historically, the beard "was universally regarded as an emblem of manliness and dignity," wrote the New York Times in 1924, "and the imagination does not tolerate the thought of a patriarch or patriot or prophet with a razor in his hand." Around the turn of the first millennium, an elderly Laconian was asked why he wore his beard so long. His reply, according to Greek historian Plutarch: "It is that, seeing continually my white beard, I may do nothing unworthy of its whiteness." Beards make men live up to them, in other words. There are practical concerns, of course. Alexander the Great ordered his military to shave in order to deprive enemies of an easy handle during combat. Fast forward a couple thousand years to that flurry of news reports about how beards are quite dirty, and may harbor specks of poop. Beards are freighted and fraught. The public is self-conscious about beards, particularly when public figures grow them. The Retirement Beard is very similar to the Exile Beard, which is similar to the Metamorphosis Beard. All three beards signal that something has changed, or is changing. The modern pioneer on all fronts is, of course, Albert A. Gore Jr., who won the popular vote but lost the presidency, receded from public view to nurse his wounds, and grew on his face a sign that said, in whiskers instead of words, "I don't give a damn. I am reborn." There was something macho and reckless about it, but also something endearing and homey. Gore had been parodied throughout Campaign 2000 as bland and robotic, but robots can't grow a beards (though give them time). The summer after his defeat, Al Gore was taken more seriously because he was taking himself less seriously. Gore emerging in 2001 with a hairy face was a first step toward a reinvention. A Nobel Peace Prize followed, though he delivered his lecture in Oslo clean-shaven. He was still Al Gore, after all. The "condition of our own times is visible on men's faces," writes Christopher Oldstone-Moore in "Of Beards and Men: The Revealing History of Facial Hair." There are "a wide variety of issues at play, including personal autonomy, social regulation, religious identity, gender roles, and sexual attraction. We live in interesting times." Indeed. The last president who wore a full, real-deal beard was Benjamin Harrison, 123 years ago, but we've got plenty of beards to go around. Jim Carrey appeared on Letterman's final show with an Exile Beard that was quite similar to President Harrison's: gray, jutting, brambly. It was an un-Hollywood acknowledgement of the passage of time. Jim Carrey, according to Jim Carrey's beard, is old. If we're lucky enough, we'll one day live to be as old as Jim Carrey's beard looks. Jon Stewart retired and bam: beard. Mel Gibson got weird and bam: beard. The longer Michael Stipe is a solo artist, the longer his beard seems to get. Stephen Colbert grew a Metamorphosis Beard as he cocooned himself between leaving his Comedy Central show and ascending to Letterman's desk. Now, Colbert is as fresh-faced as a boy making his First Communion. The beard was fine as an interstitial. It served its purpose and was then bladed away. "Beards augment perceptions of men's age, social status, and aggressiveness, but not attractiveness" was the title of a 2011 study in the journal Behavioral Ecology. Beards: guaranteed to make you look old and wiser but not necessarily better. In the sphere of celebrity, beards are cause for headlines, but in normal life, beards are so in they're out. Among normal people in 2016, beards are a sign of conformity, not rebellion. Everyone has a beard. Many non-famous men have beards so robust and theatrical that you want the ghost of Alexander the Great to materialize, grab a fistful of beard, yank them to the ground and say, "In war you'd be dead." This isn't ancient Macedonia, but some draconian rules still apply, especially to celebrities like singer Zayn Malik, who liberated himself from the British boy band One Direction last year. In a world where the media exert profound control over celebrities, and vice versa, a beard may be a famous man's only natural way to say, "Hey, I exist, and I am sole groomer of my image. Look at my beard. Just look at it. There is nothing you can do about it." "I wasn't allowed to keep it," Malik recently told Complex magazine about his facial hair attempts during his One Direction days. "Eventually, when I got older, I rebelled against it, and decided to keep it anyway. That was just because I looked older than the rest of them. That's one of the things that is now quite cool. I get to keep my beard." Zayn's face is free, and now so is Zayn.